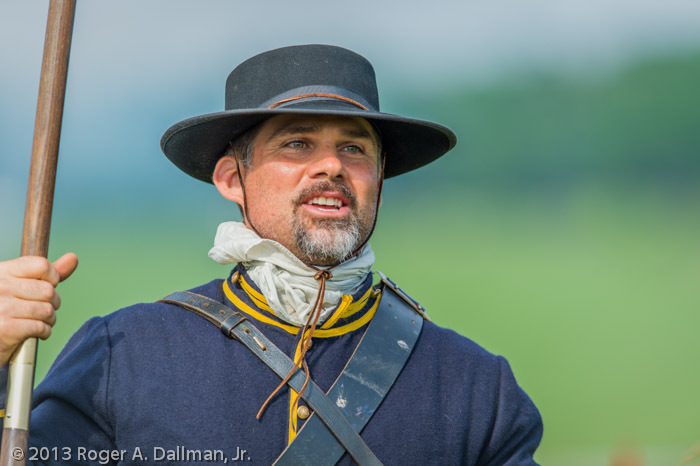 I was off to Gettysburg the last two weekends to continue on my sesquicentennial project. 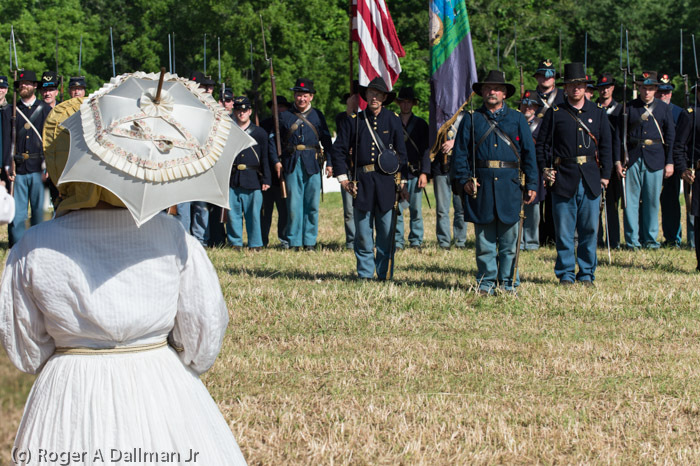 Gettysburg is one of the biggest draws to Civil War re-enactors and historians because it represents the major turning point in the war. The Confederates still won many battles, but, from Gettysburg on, the conflict turned in the Union's direction until the final capitulation at Appomattox. 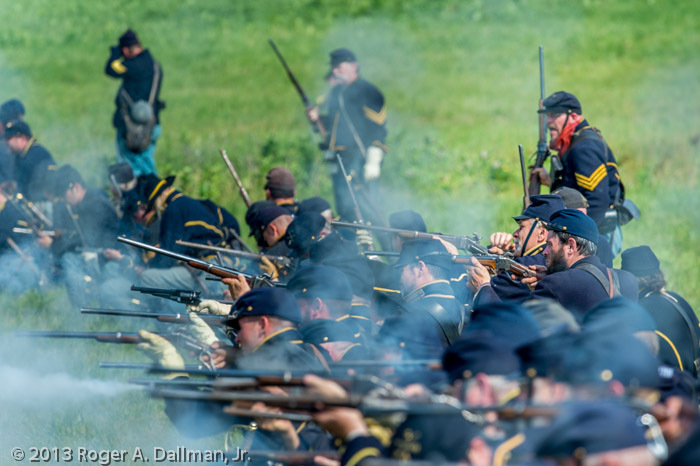 From a photographer's point of view, this was a difficult event to shoot: it was hot and humid (I hate that); the scale of the battles was hard to capture from my position; and there were lots of visitors and modern features to avoid. To top things off, we were in the middle of a field, at mid-day, the worst light of the day. I didn't have the freedom to move anywhere I wanted, so I tried to crop out as much as I could in the viewfinder and resigned myself to some edits in Photoshop. As for the light, sometimes you have to shoot when you have to shoot. I wanted the photos whether the lighting was good or not. Since re-enactments are not allowed on the actual battlefield and there were more than 12,000 re-enactors, each weekend was held at a different location. Two of the three sessions, I had no idea what the location would look like. We ended up in the middle of some huge fields of Pennsylvania farmland. Still, it was fun and interesting. The re-enactors were excited about being involved and completely into their roles. I had my D4 back with a 400mm f2.8 attached (the lens weighs 10 pounds) and my D5200 attached to a 70-200mm zoom. With the infamous photovest filled with batteries, memory cards, a couple lenses, and a bottle of water, I was ready for whatever. The battles were chaotic, especially with the horses carrying cavalry troopers. I wanted to capture the individual action more than the huge numbers, but the scenario shifted quickly. Then the dismounted troops would cluster and fire. Cannon and musket smoke added to the realism, sometimes obscuring parts of the battlefield, just like the real battle. They only had so much room to maneuver, even on this large field, so the combatants would break apart; rally; and charge, again. At the end of each scenario, a bugler would blow Taps. All the re-enactors would render respects to the more than 50,000 casualties of that terrible, three day battle. After the battle, the cavalry from both sides, did a pass-in-review. These were my favorite times because I could focus on individuals. I also went into the camps and vendors' tents to get some photos before and after the “battles.” There were civilian re-enactors there, as well as soldiers. There were even a couple of period-correct photographers there, complete with view cameras. They were developing real tin-types in their tents. 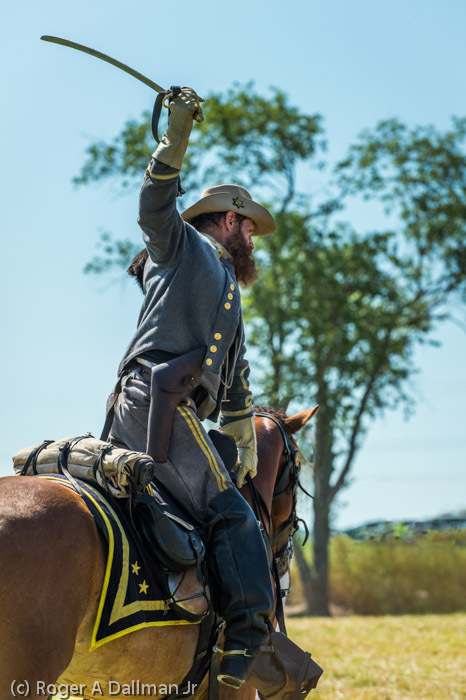 The three days were really a blast, and I'll be hitting a few more battles before we reach the conclusion of the sesquicentennial, at Appomattox, Va, in April 2015. 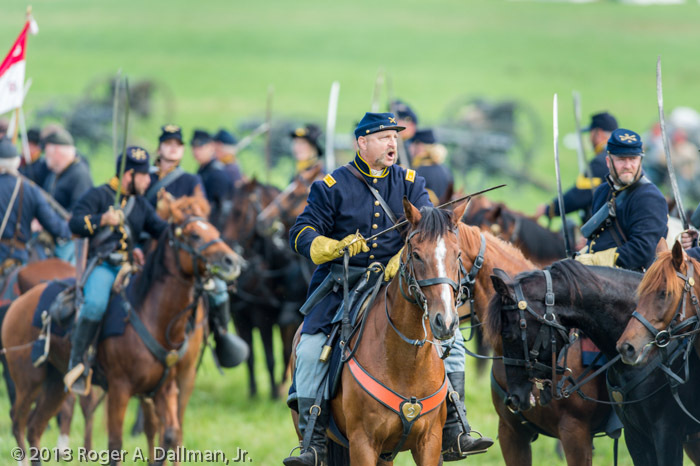 I put some more photographs on my site, at http://www.pbase.com/radjr/civil_war. 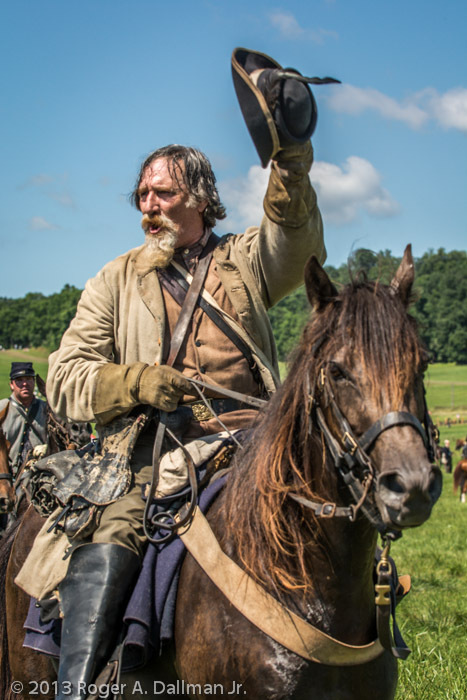 I hope you'll join me at some of the other battle re-enactments along the way. Until then, keep making photos and have fun. Posted in Featured, Travel and tagged with Civil War. July 11, 2013 by Roger.